Tapias Group - Show Folds. Photo: Disclosure. The International Festival of Dance Traffic comes to Curitiba for the first time, with intense schedule in the days 15 and 16 August. The event, that in 2018 circulated by nine Brazilian cities and Paris, brings renowned artists and companies for presentations and workshops, Largo in the Order and the Auditorium Salvador Ferrante (Guairinha Theatre). Among the groups are the French CFB Christian and François Ben AIM, African Romual Kabore and Tapias Group. The highlights of the program take place in Guairinha, always at 20.30. On Wednesday (15/8), the acclaimed French dance company CFB Christian and François Ben AIM, performs presentation Valse En Trois Temps - Solo, inviting the public to question about the abstract notions of fluidity of the body in space. The French company Group Tapias, closes the program on Thursday (16/8), the spectacle Folds. In this choreography, Flavia Tapias unites dance, poetry and bodily expression inspired by the text of Louis Serguilha and the former practice of origami. The presentations will also in unconventional places, Largo making of the Order and the area outside the house Hoffmann – Movement Studies Center, stage various forms of expression through dance, Always at 18:30.
International Festival Traffic in Dance, poster. Disclosure. Opens the Festival, on Wednesday (15/8), the show Ouroboros, also the Tapias Group. Dance is used the mystical symbol to convey the constant evolution and movement of life ideas, resurrection, destruction and replacement. On this same day, shortly after the Ouroboros, Francesca Ziviani presents the soil “The Naughty Girl”. A journey through the shadow of ourselves, a death and a rebirth. An attempt to turn dark in love. The African country Burkina Faso, on Thursday (16/8), Romual Kabore displays Romual Sans D, solo show in which the artist seeks elements of their life histories to uncover the intimate dancer, exposing their instabilities and tracing their fate. In addition to the presentations programming, the Festival brings a workshop, taught by Flavia Tapias, aimed at deepening the preparation work of the interpreters for the various developments of contemporary dance. The Project, which is in its 16th edition, It has ten international companies, ten national, Rio six young choreographers and two performance projects with guest designers. Curitiba, now, is contemplated as one of the ten cities of the world through which the Festival. The Transit Dance includes, yet, artist residencies, with workshops and creative workshops, promoting the democratization of artistic expression through contemporary dance. 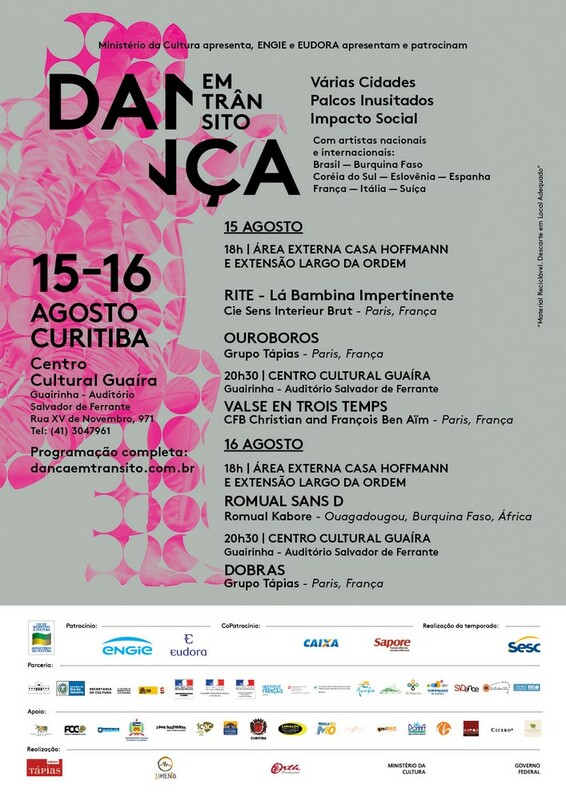 According to the founder and curator of the project, Giselle Tápias, "Traffic in Dance Project, there 16 years creates an artistic host environment of contemporary dance for several cities of the world, now includes the Curitiba Festival itinerary for debate around art and encourage the development of the language of dance, through the exchange of experience between artists and companies ". Every new edition, the event is notable for extending access to new audiences, consolidating a powerful role in the cultural process of democratization and strengthening the commitment to contribute to the strengthening and promotion of art. FBC Christian and François Ben Aïm - Three Time Waltz Em - Solo. Photo: Disclosure.